The exclusively furnished villa for 7 people with all mod cons is surrounded by 140 m² of terrace, partially covered and with various places for seating, large pool with children’s section, eco- sauna, outdoor shower, barbecue, beautiful garden with tropical plants as well as a covered car port. The house has 3 floors, ground floor, a large living/dining area with open plan kitchen, fully air conditioned as well as a sleeping area equipped with large roof ventilators, 2 bedrooms plus a modern bathroom with toilet, first floor: double bedroom with air conditioning, large bathroom with shower and beautiful terrace with fantastic sea view. Separately located: for 2 extra people (extra charge) lower apartment with double bed/ living room, air conditioning, kitchenette, shower/toilet, winter garden and direct access to pool and outside shower. Hedges surround the whole site. The apartment will not be rented separately from the main property. Located in a quiet villa complex on a cul–de-sac. Further Details: The healing climate for people with rheumatic and heart problems attracts many guests even in winter. There are people who stay in Calpe the whole year round because of the beneficial effects of the local climate. It is less than a mile to the bathing cove and two miles to the larger beaches. The local area boasts gorgeous coastal landscape, loads of sandy beaches, caves and animal parks. In Benidorm you can really taste the high life. The surrounding area is mountainous, with large stretches of fruit plantations and vineyards, the many wines are both of outstanding quality and reasonably priced. In the many surrounding villages you can find traditional Spanish life and proud local people. The history of Calpe: Calpe and the surrounding area was an important settlement area because of its strategic importance. A people of many cultures: The province was under Moorish rule until the 14th century after which it was incorporated into the Kingdom of Valencia. The lively festival “Moros y Christianos” commemorates the end of Moorish dominance in the area. The area experienced an economic boom in the 18th century and Calpe became an important trading area and fishing harbour. Nowadays it is a much loved holiday resort and offers its guest many promenades, restaurants, tourist attractions, water-based activities and boat trips and much heritage and in the heart of the old town area beside Arrable, the Moorish quarter, there is a group of buildings which consists of Torreo de la Peca, the fortifications walls and the old city church. This is the only example of the gothic Mudejar style in the whole autonomy of Valencia. Shopping, temperature, arrival, marina: There are many shopping opportunities in Calpe. There is a market on Saturday, you can buy fresh fish in the harbour and get everything else you need in the town itself. The climate is typically Mediterranean and very mild, the summer lasts 3/4 of the year in the coastal area. The average temperature in the province of Alicante is 17 ºC, in the off season you can expect 26-28 ºC, in the middle of summer from 32-40 ºC and 12-20 ºC during the winter. For the trip from Alicante airport, in emergencies also Valencia (72 miles to Calpe) you can rent a car in the airport. By car you take the Barcelona/Valencia motorway directly to Calpe. You can also get to Calpe by train. The N-332 coastal road leads from Alicante to Valencia though very interesting landscape. Regular buses connect Calpe to Valencia, Barcelona, Alicant and Madrid. The harbour of Puerto Blanco, over half a mile away and the Calpe harbour –2and a ½ miles away- offer berthing places for all. There are more harbours nearby. The apartment with separate entry passage has a small conservatory, shower and kitchenette with 4 ring hob, refrigerator, and air conditioning. It has direct access to the pool and garden. The living area is separated over three levels *** Ground floor: Bedroom – Living/Dining room with open plan kitchen and view over the sea *** separate entrance to the lower studio with shower/toilet, kitchenette, bedroom, conservatory and terrace with direct access to the swimming pool with outdoor shower. The large terraces offer sunny and shadowy areas, a covered over, well lit seating area can also be used during the evening. The roomy barbecue is also provided. The eco-sauna is located in a small stone outhouse. The whole area is walled in and here and the whole house itself is covered by a security system. A water reservoir guarantees a clean water supply. In winter a gas central heating systems provides cosy warmth throughout the house. Normally you will only really need it during the evening. There is a local couple that looks after the house, garden and swimming pool and will be happy to assist you at any time. Vi var två familjer som bodde tillsammans i huset, totalt 8 personer varav 4 barn. Det var gott om utrymme för oss alla utan att vi behövde känna att vi var på varandra. Poolen var bättre än jag vågat hoppas på, den var stor och med ett härligt område runtomkring. Jag skulle gärna åka tillbaka! Sehr schöne Villa in einer schönen Gegend. Vollausstattung in der Küche. Wie beschrieben und versprochen war genau so. Nachbarn sehr nett und hilfsbereit. 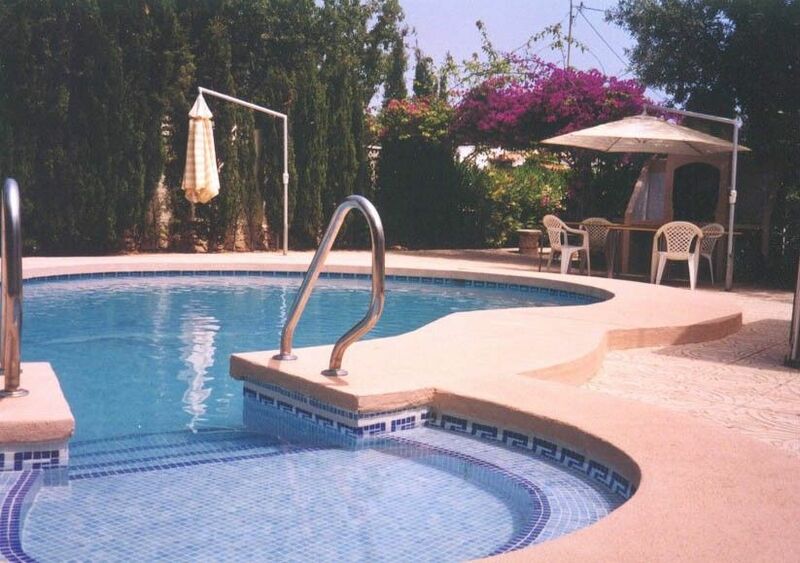 Die Villa war sehr sauber.Pool und Garten - super.Strand in Calpe selbst sehr schön und sauber. Wir hatten sehr schönen Urlaub. Sehr empfelenswert. The house is located on a cul-de-sac in a quiet residential area, just over half a mile from a small bathing cove and just over three mile from the town with its large sandy beaches. The entrance to the house is a few steps above the car-parking place, the studio is at ground level. There are two good restaurants situated directly on the small Puerto Blanco beach, another restaurant and a small Tschibo outlet where you can buy fresh bread are located 150 meters away. Tennis courts and a children’s playground with accompanying restaurant and swimming pool are located 300 meters away from the house. Golf: There are both large and small golf courses located in gorgeous landscape in and around Calpe. There is the 9 hole Ifach golf club only 2 miles from Calpe, which also offers a beautiful view of the sea. The Javea Golf club, also 9 holes, is exclusive and located snugly amongst the mountainous landscape, although it is only approx. 3 miles from the sea near Javea. Further out near Denia is the 18 hole Golf La Sella golf course and when you are there you can also have a great walk along the beaches in Denia. Ski: Skiing is also possible in winter in the mountainous regions.